Baby is: She's fully formed, just adding fat to her little body. She's also getting a little squished in there, which I can tell by her movements. No more big kicks, just wiggles and readjustments which are very visible from the outside and hilarious. She also gets hiccups often and because she's already head down (good job, baby girl!) I feel like I get hiccups in my right hip. 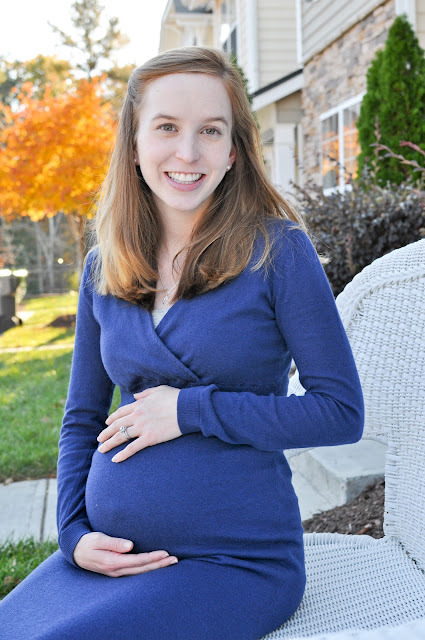 Maternity Clothes: I've stopped buying maternity clothes since I'm so close to baby's arrival. But I have been discovering some non-maternity clothes I can wear now and hopefully after baby comes too. Like the dress in the picture above. It's non-maternity, but fits me great as maternity, I just went up a size. Plus I can wear it comfortably with my post-baby body. Sleep: I'm definitely needing more of it! Still waking up every 2 to 3 hours for a bathroom break or to walk out the occasional leg cramp. Cravings: Cheese...extra sharp cheddar cheese is delicious to me with anything- grilled cheese, on crackers, plain, thinly sliced on tart apples, oh yum! And strawberry keifer with vanilla whey protein mixed in...somehow that combo of vanilla and strawberry and tartness from the keifer is so yummy to me! Week's highlights: Every little wiggle and every little hiccup is a highlight! I also got really excited to get to start going to the midwives every week as well as go ahead and schedule the rest of my weekly midwife appointments. While the receptionist was scheduling the rest of my appointments I think I told her half a dozen times "This is so exciting!". "For this child I have prayed"
You are so adorable! I'm going into week 14! It is so exciting. I've had quite the bit of morning sickness and so forth though.